When preparing for a long distance move, obviously you’re going to have quite a bit on your mind. The to-do list is steadily growing, you’re trying to ensure that everything is ready for you once you arrive at your new location. We don’t want you to have to worry about the safety of your belongings—leave that to us! We’ve been moving clients from state to state, cross country, even under certain circumstances, internationally now for years. 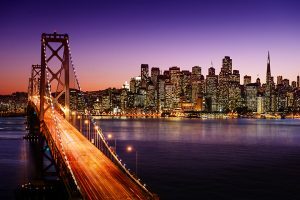 It is our experience that San Francisco area residents have come to rely on. We know how to safeguard your stuff, we know how important your things are to you, and that is why we treat everything as if it were our own. The process is simple—that’s what we are here for after all, to make your California move as stress free and as easy as possible so that you can focus on what you need to get done. Once you decide to schedule your cross country and or interstate move, simply call us and one of our representatives will assist you in getting the details together. You need to provide a list of all of your items as well as notifying us of any specialty or fragile items that may need to be transported in the long distance move. We can provide everything you need for your move from San Francisco, to include boxes, packing, tape, blankets, crates, be sure to ask about our moving material options. Our team is experienced when it comes to packing up your home or business. We ensure that everything is secured and nothing is in danger of damage. Upon arrival at your destination, we can help you unpack, putting everything in its proper place. Is the company insured? Especially in dealing with your valuable items, you want the peace of mind that comes with knowing they’re responsibly insured. Are they licensed to move cross country or between states? This is an important one. A good moving company always stays abreast of the latest in rules and regulations. What sort of reputation do they have? This is a long distance move after all—you want to know it’s a company you can rely upon. Are their rates affordable? Will there be additional fees? The best long distance movers make their fees and costs known up front. No surprises, no hidden charges. Our goal is to give you the highest quality move possible. Whether from San Francisco, or anywhere in California, we can get your items where they need to be in the most efficient way. We would love to be the moving company that you trust with your possessions. Call today and let’s get started! You can also visit our FAQ’s page in case you have more questions.